Right now you are sleeping peacefully in your bed. This is a very good thing after the last few days. I know you do not understand everything that is going on, but mommy and daddy will take care of you. We promise to get your allergies under control so that the stuffy nose and cough leave you alone. Just when we thought that was the only thing going on you woke up screaming and so scared just before 4:00 this morning. When Daddy arrived in your room you declared that your eye was stuck shut. Sure enough your left eye had junk all around it. You were such a brave kiddo letting Daddy get everything off. Of course you would not go back to sleep. You were too afraid of your eye getting glued shut again. 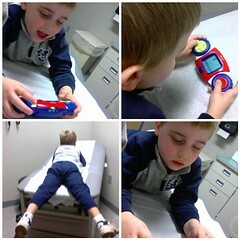 When we went to the doctor today you were such a big boy telling them everything that was wrong. You even mentioned how you bit your own hand while eating breakfast. Thank goodness we found out that your breathing is nothing serious, your ears look fine, but the eye is a different story. You most definitely have pink eye (Mommy knew that) and now have to use medicine for a week. I know that you hate having eye medicine, but please try to be brave. When you kick, scream, and move around it only takes that much longer. Daddy and I promise to do our part to make this go as quickly as possible. I found a neat new Mommy meme and decided to participate. To join in please click on the button below. Aww, sick kids are so pitiful! They just break your heart when you can’t magically make them feel better. Poor guy! Take care, NHL! I hope y’all have a better night tonight. Poor thing. Okay, my itching just reading about this. Poor kid! Let him know all the blogging moms wish him well! And watch those door handles and misc frequently touched items. When my kids were little we once passed pink eye for 3 weeks straight. ICK! Good luck and best wishes for a speedy recovery! Pink eye is so yucky! I hope nobody else catches it! For the toys, once the boys are asleep, toss whatever you can into the bathtub with hot water and antibacterial soap (or maybe some bleach? ).